In the email mini-course, “7 Unique Ways to Make Money with Your Quilting,” I talk about photo memory quilts as a great way to create a niche in your local quilting market. A quilt with special photos is a wonderful way to commemorate events and the live's of special people. But how do you go about transferring one of your own designs onto fabric for the one-of-a-kind quilt you want to make – for your own family or friends or for a customer? There are a couple of ways to use an inkjet to get an image onto fabric. The first is to use photo transfer paper. This is the kind of paper you iron onto t-shirts or other fabric. This is usually not the best choice for a quilt because it can wear off easily and is tacky to the touch. Instead, there are ways to print directly onto muslin fabric from your inkjet printer. Basically, you can purchase muslin already affixed to a stiffener that will run through your inkjet printer. Or, if you are brave of heart, you can attempt to make the printer sheets yourself. But, this photo copy fabric is available at most quilt shops or craft stores, and is also available on the Internet. The first thing you'll want to do to get your design onto fabric is to create your design on a normal sheet of paper that will fit through an inkjet (8-1/2″ x 11″). Make the drawing as large and bold as you would like it to be when it is on your quilt since you will be printing at the same size. help you out with scanning. Once you have the file scanned, you'll want to save it in JPG format at a relatively high quality (300 dpi or more). Now, all you have to do is print the JPG image to your inkjet printer and use the photo copy fabric. You'll soon have your great image on fabric that you can incorporate into your quilts. And, since you have the design in a JPG file, you can use it over and over again. NOTE: If you do not have a computer, go to your local Kinko's and tell them what you are trying to do. They should be able to help you from start to finish, including scanning, transfer to a CD (for you to keep), and most likely printing out on an inkjet printer (you will need to buy the photo copy paper). 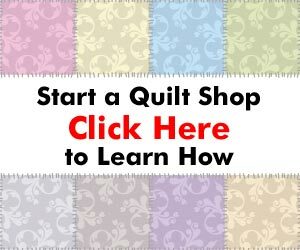 Previous post: Are There Too Many Machine Quilting Businesses in My Area? Next post: Quilt Prices Are Too Low!